For retailers, the holiday season is an important time of year. Statista reports that the holiday retail sales in the U.S. are now more than $630 billion. As much as 30 percent of a retailer’s annual sales occur during the holiday period. To make sure you’re getting potential customers spending in your store, you’ll need to get creative with your marketing. Choose from our range of free Christmas flyer templates for a simple way to promote your business and increase your sales this holiday season. Many people’s holiday traditions include the giving of gifts. For retailers, this means two things. First, that consumers want to spend their hard-earned money, and second, that they must compete with other retailers to entice consumers away from that hard-earned money. To keep up with the competition, your business must use every tactic it has available, including promotions, sale events, and special offers. Whether you own a brick-and-mortar store or operate an online business, you need a way to separate yourself from your competitors. Get also started with your resume. Seasonal specials and December discounts are two important strategies. Flyers are, as well—however, to stay ahead of your competition, make sure your flyers are seasonally appropriate and have holiday themes. Sell goods and services – Including winter specials and discounts on your flyer is a great way to increase your Christmas-season sales. This can then create repeat business and give your overall sales a boost throughout the year. Promote holiday events – Whether you want to let employees know about an upcoming Christmas party or you’re trumpeting a holiday fundraiser, a Christmas event flyer will help you spread the word. Elegant red design with Christmas decorations. When creating your Christmas flyer, you need to consider both its imagery and text. Here we have provided some guidance on how to make the most of your content and get the best possible results. Visual appeal is critical in catching the reader’s attention. You need to select images that draw the eye to your content and encourage the reader to learn more about what you’re promoting. Of course, you should consider your audience and tailor any imagery to suit. For example, if your business sells Christmas trees, you’ll likely want to use a picture of a Christmas tree to promote it. If you don’t need to be this specific, you can always opt for more generic images such as Christmas presents, Santa Claus, a snowman, or baubles. When sourcing images for your Christmas flyer, you can pay for royalty-free stock photos from such sites as Shutterstock. Another option is to download free images from sites such as Pixabay, but be aware that the choice of available imagery is more limited. Whatever you choose to do, make sure you have permission to use the images and are not infringing on any copyrights. Whether you are promoting a special offer, discount, or seasonal special, the flyer’s text may make the difference between a couple of extra sales and potentially hundreds of new and repeat customers. Description – Under the title, you may want to include a section to add further information relevant to your event, promotion, or greeting. If you are promoting a one-off event, don’t forget to include its date, time, and location. Call-to-action – Depending on what you’re using the flyer for, you may want to use phrases such as “Place your order today” or “RSVP before December 15th.” An effective call-to-action lets the reader know what they need to do next and should encourage them to act sooner rather than later. Contact details – So that potential customers know where to get their great deal, make sure to include details on how to contact you. This may include a physical address, website, telephone number, or social media accounts. Dress someone up in a festive-themed costume to hand out flyers in your area. Santa Claus or a reindeer is sure to catch the attention of passersby. Send a “Winter Specials” email to your newsletter subscribers. Make it extra special by attaching a personalized season’s greetings e-card. Hold a stall at a Christmas market and offer a flyer to every person who makes a purchase or enquiries about your business. Another important aspect is timing. It may seem obvious, but there is little point in distributing flyers during spring if you are promoting a winter special. Carefully considering all the distribution options in advance will ensure you get your flyer in front of the right people, in the right place, and at the right time. If you don’t have time to design a flyer from scratch, download one of our free Christmas flyer templates. It’s as simple as customizing the text and images, then printing and distributing the finalized flyer. We have lots of different themes to choose from, and we also have templates that can be used to create season’s greetings cards as well as Christmas and New Year event invitations. Whether you're hosting a steampunk Christmas party or selling crafts for charity, this free flyer will catch eyes and get the word out about your event. Beautiful grunge design with old paper background for your message. Promote your winter event with this snowy flyer! Invite others to a Christmas dinner or to the local sledding hill for some fun. You can use this theme for any winter season or winter holidays events and promotions (Christmas, Christmas Eve, New Year). This free flyer template can be effective for almost anything from selling Christmas trees to hosting a Christmas lunch. Share some seasonal greetings! Let others know about things going on in your business or life; use this flyer as Christmas advertisement, gift certificate, or a greeting card. Have Santa help bring eyes to your cause! Use message section to tell your customer about new products, store discount or coupons, or special Christmas promotion. Throw a New Year's party! Invite others to celebrate the end of the year with you, or let them know about some of the discounts and sales going on in your business with this attractive red holiday design. Let others know about your event with this simple holiday design. Use this free Christmas party flyer template to invite guests to partake in festivities and games or to make a greeting card for your friends and family. Tell your friends and family what you've been up to with this beautiful card. This template is fully editable so you can easily add a picture of your family, add your own text, change colors and pictures. Celebrate the season! Invite friends and family to your holiday celebrations with this winter-themed greeting card. Let others receive the blessing of giving, and give them an opportunity to share their abundance with those who don't have much through a "Christmas Benefit." Use this Children Christmas Party event flyer template to invite people to your charitable Christmas celebration, or other holiday event. Begin the end-of-year celebrations with a party for the children! Just because Christmas is over doesn't mean the fun is – invite some of the neighborhood's kids on over and enjoy the winter season. Celebrate an annual tradition! Invite others to join the festivities as Christmas nears, and continue a yearly custom of jubilation. Advertise the Christmas Market! People don't usually start buying Christmas gifts until the end of the year begins looming. Give them the chance to get a head start with a Christmas Fair. 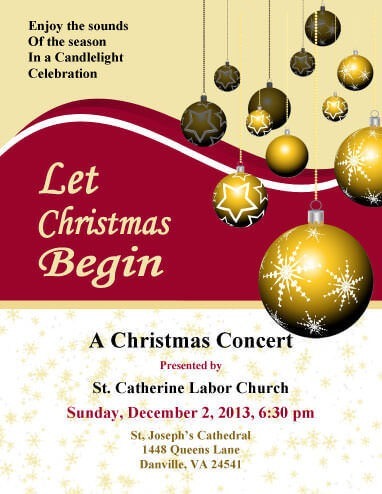 Advertise your Christmas Eve service with this flyer. Whether used as a flyer or an invitation, this print-ready template will be sure to get people through the doors on the night before Christmas. Gather together for a Christmas lunch! Invite your friends and family to join you for a meal together to rejoice over the holidays. Have your friends join you for a Christmas luncheon! The holidays are a great reason to spend more time with your friends and family and enjoy a good meal while you're at it. Create professional-looking Christmas Menu with this simple and elegant template. Start off the Christmas season by inviting the community to share in the timeless tradition of singing Christmas carols, and thus spread some holiday cheer. Listen to some Christmas carolers! Traditional carols are a big part of the canon Christmas celebration. Invite others to hear novel renditions of their favorite classics. Tell everyone about your Christmas gift sale! Everyone's trying to get a good deal around the holidays – let them know one of the places they can find a great one. Send the season's greetings and let someone know how much you love them and are thinking about them this Christmas with this simple elegant flyer. Send your merriest Christmas wishes or invite to a Merry Christmas party with this Christmas greeting card. Let someone know how much they mean to you and that you are thinking about them as this time of the year rolls by. Send your Christmas and New Year's greetings! Let Santa and his trusty reindeer head this card that you can send out to family, friends, acquaintances, or even strangers. Wish others happy holidays or invite them to a celebration with this vibrant Merry Christmas flyer. Gather to celebrate the holidays! Invite others to join you and your family at a party to commence the holiday season with good cheer. Welcome others to help you celebrate Christmas! Invite them for food, games, or a gift exchange so that you can all spend some quality time together during the holidays. Use this Christmas season to thank others! Let someone know how much you appreciate them and what they've done for you, or maybe just thank someone for having you over for a Christmas meal. Let others know that you're thinking about them this holiday season, and tell them how important and special they are to you. Use this flyer to create unique and personalized flyers by writing text in bubbles by hand. Create your own message and look professional with our After Christmas Sale flyer templates. Downloadable in Microsoft Word, the flyers are easy to customize with your logo, location, offers and product description. Generic design will fit any type of merchandise from fine jewelry to a men’s store. The text boxes have room for dates and details in a stately font style. Clean graphic with large letters requires little or no editing. You can insert a text box or logo for more information if required. This colorful flyer is appropriate for the little people’s shops. A rocking horse and other toys create a playful design. Seasonal red and fresh green colors announce the details of your sale. Several text boxes are ready to fill in, for logo, address and sale information. Yummy food and subtle tones! Insert photos of your baking masterpieces or any other foods you have on sale. A fund raising event, bakery or grocer can use this advertisement. The large red ribbon announcement tops a lively background with party gifts and balloons. Perfect for advertising children’s clothes, toy stores, party places. Gold wrapping paper with a shiny ribbon background sets the stage for a sale at a gift shop, clothing store, home or decoration market. Your location and sale details along with dates and/or hours can be customized. For a youthful appeal, this flyer requires little editing. A large text box is a good place to insert all the details about your sales event. Red and green color scheme with Christmas decoration, stars, and ribbon. Bright and cheerful, the sale information stands out. You can add dates and store information in the artful boxes.